Successfully Added Metallic MP3 Watch Player 2GB - MIC + Line IN Record to your Shopping Cart. Metallic MP3 Watch Player 2GB - MIC + Line IN Record. Stylish, fully metallic MP3 watch player with 2GB of internal flash memory and a built in MIC for making WAV recordings plus an audio Line IN for recording audio files directly to the watch. 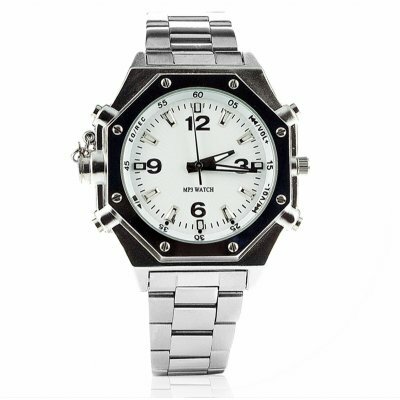 Friends will never know that this well constructed and sleek watch can be used not only for telling time, but for listening to your favorite MP3 music. Not only this, but the watch is both shock and static proof as well as water resistant, has 5 EQ modes, and has color LED indicators for easy operation. Fun, stylish, and a made in China low wholesale price make this a hard MP3 watch player to pass up. Brought to you exclusively from the original source for factory direct wholesale electronics, Chinavasion.